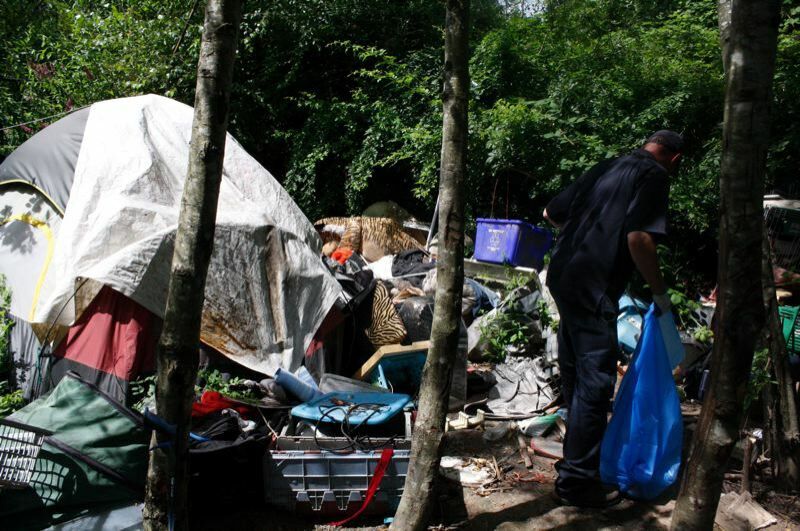 A temporary Portland program to clean up homeless camps has grown into a $3.6 million-a-year operation that needs better management, according to a new city audit. The audit released Wednesday said increasing demand for services has pushed the program past its capacity. Among other things, the program needs to do a better job collecting data and communicating with residents who make complaints and homeless people in camps to be cleaned up. "For years now, bicycle riders have had to deal with this situation. It's one thing when people live near the path. However, it's another thing entirely when people live on the path," founder Jonathan Maus wrote on the organization's well-read blog, which included video he recently took biking along the debris-strewn path. You can find the BikePortland post here. The Homelessness/Urban Camping Impact Reduction Program was created in 2015 as the City Council was first beginning to increase homeless services and funding in response to the affordable housing crisis. It provides a single source of contact for resident to report homeless camps that need to be cleaned up, among other services — known as the One Point of Contact reporting system. "The program has had some success. Cleanups have improved living conditions for people in camps, and the program has made it easier for the public to report camps," said the audit released by the City Auditors Office titled "Cleanups of Homeless Camps: Improved Communications and Data Needed." But, according to the audit, complaint collection, tracking and responses have not kept up with increases in volume over the past three-plus years. Among other things, the audit found cleanups are not adequately prioritized, and the time required to finish them is not being tracked. spreadsheets should give way to a comprehensive data system to enable complaint tracking, status updates, risk assessments, and cleanup prioritization. The program also should improve communication with the community, both people reporting the camps to the City and those living in the camps," the audit said. The program also dispatches crews to clean up homeless camps where health and safety issues are identified. Although light trash cleanup does not disperse campers, more extensive cleanups require them to leave the camps. In such cases, the city must store possessions left behind for 30 days under the terms of a court settlement. Some homeless people said it was difficult to retreive them. The audit found the program estimated it removed 2.6 million pounds of garbage from campsites during the 2017-2018 fiscal year alone. The audit found cleanup crews treated campers with respect, but that some campers wanted more information. Likewise, those making complaints appreciated the simplicity of filing reports, but wanted to be updated about cleanup efforts. "People who reported a camp and expected a cleanup were dissatisfied when the response was slow or lacking. About 37 percent of respondents said their complaint was not addressed," the audit said. The audit made several recommendations for better tracking complaints and responses, including using data "to analyze and improve the effectiveness, efficiency, and timeliness of cleanups." Mayor Ted Wheeler thanked the auditors office for its work and said many of the recommendations are already being implemented. "We appreciate your office's work to help HUCIRP improve its program on behalf of the City of Portland. The objective lens with which your office examines City services provides the public and our programs valuable insights and feedback. We would like to specifically thank your staff who observed City vendors' interactions with individuals experiencing homelessness, and for reporting that those interactions were respectful," Wheeler said in a response letter.